I have been working on 2Volution for almost 2 years now, rewriting code constantly because I have learned A LOT in the proccess of making this game. 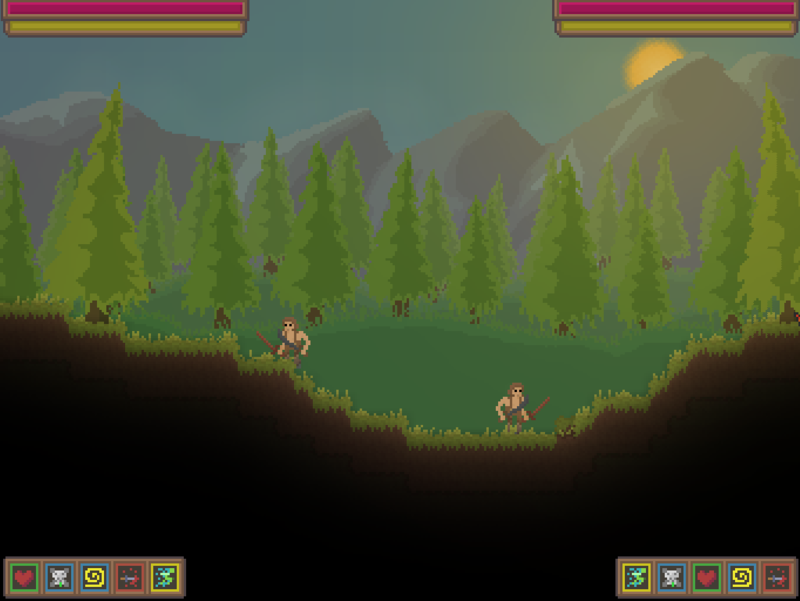 2Volution is a 2 player action/fantasy game based around teamwork in procedurally generated worlds/levels. 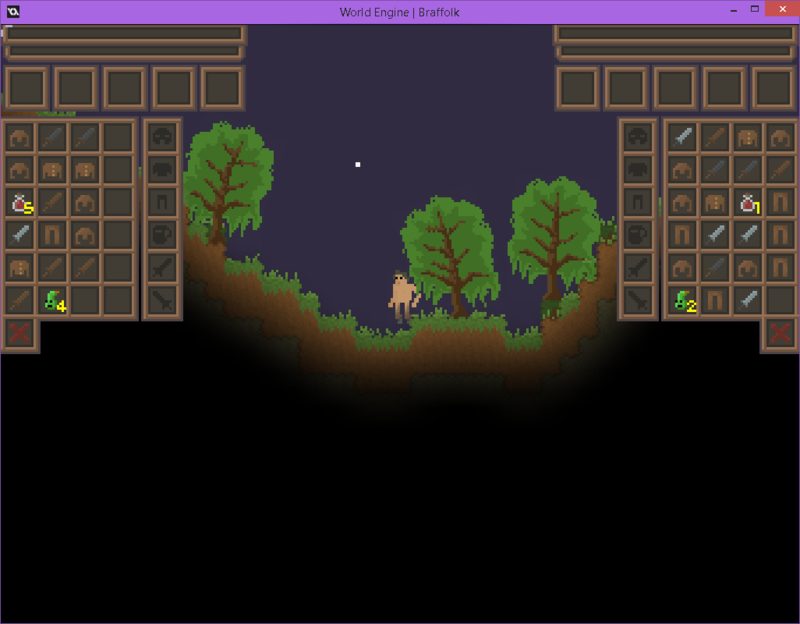 Both players start off in a procedurally generated world with basic weapons, their goal is to fight off all the monsters and bosses in the level to get a new and a harder level/world. The world is block based and players can destroy it by using special attacks and explosives, enemies will also be able to interact with the terrain and even build on it. Combat is based around abilities and teamwork. Both players can select 5 abilities they will use, every ability will have a regular form and a spirit form. Spirit form means that both players share one body and their abilities will do different things than in the regular state. In spirit form there are combos which players can create by using combos in an order. Players will also be able to dual wield different weapons, each of them will have specific speeds. All levels are procedurally generated and will be based on the tribe/culture of the enemies that have settled in that world. in a rainforest like area with huge mines which they use to gather resources to create weapons. They will also build most of their buildings/homes underground. 'Do they like warm areas? Do they like cold areas? Do they like to live underground? Do they like to live on the ground? Do they get food from farms? If a tribe has 2 rules which go against each other then they either have a middle of those 2 or one of those 2. For example if they like to farm & hunt then they will probably do both but sometimes they will do only one of those. NOTE: If the terrain won't appear then resize the window a bit, then it redraws the terrain. Edited by Braffolk, 04 February 2015 - 02:31 PM. Nighttime should definitely be darker. Other than that, good work, Braf. Yeah, It should. I just have a placeholder background right now , it should be day instead but I'm really bad at drawing bigger things such as backgrounds. There is no day & night cycle right now. Now add some clouds moving across the sky and you're done. Night time should be so dark that it's hard to see where you are even going and you'd need to hold a torch to hold the way. This could also be used as a tactical element in PvP, as players could linger in the dark without other players noticing them as easily. It is possible that if it's too dark players can get annoyed by it. Some people have pretty dark screens so I can't make it too dark, Or I could add an option to change the darkness. The only problem with this is that I'm really bad at drawing backgrounds. Edited by Braffolk, 09 November 2014 - 11:29 AM. Isn't that a background from a game that got on IndieGoGo lately (Planet Centauri or whatever it was called)? It is, I just brought an example. Yeah, sky has a 'gradient' but trying to make pixel art look realistic isn't the best thing to do. I guess so, but the sky in this image also seems to have a gradient; it's just hard to see because there are clouds on top of it. 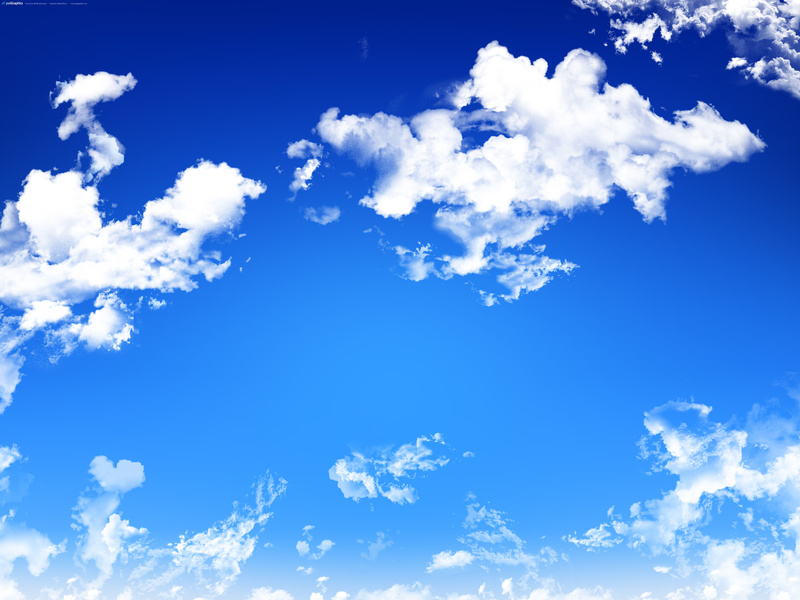 Just like I said in post #4 you should add some clouds to your sky. Just place them on top of that gradient. HeyyyyY! I remember this game way back when. Glad to see it isn't dead. I like how all the plants and everything move. Does it go fullscreen 1x1 zoom on pixels or does it always stay low res for that retro look? Any thoughts on how the AI will work? Similar to terraria or more complex? Also do you have any roadmap for development or are you just kind of chugging along? Hmm. What about an animated background like we see in games made for children? There are many cool factors in those such BGs as timtimate stars and fun & cute shade. I'm not sure what do you mean by that. I don't really know any games made for children. It will stay low res, the minimum zoom is 2X and maximum is 10X. Currently I have no real roadmap, I'm probably going to create one though. Right now I'm working on the inventory engine which could support any kind of items have unique effects, so no stats on any weapon will be pre-defined. Ill post about it when I have basic stuff done, probably tomorrow. Edited by Braffolk, 10 November 2014 - 07:11 PM. Nice work this game is impressive! I'm working on Item engine right now, I have a really nice inventory & item engine set up now, what is still left to do is wearing the stuff. Here is a pic with 6 Kepon's in inventories. Every item can have unique stuff to it, they aren't limited to their "item ID's" , for example I could have 2 iron swords and one could make enemies burn and other could freeze them. I decided to replace the boots slot with a backpack slot because the player is a faun like creature. the new slot can have backpacks,capes, and other stuff which can be worn on the back. 2Volution is a 2 players game but also has a lot of different features so I needed to think of a way for players to be able to easily interact with the UI. I came up with 'sub-mouse' system where both players have their cursor thingy which they move around with the same keys they move the player with. When the movement is done right with "clamping" to slots and tweening properly it feels really easy to move around in the interface. I hope to get a basic wearing system implemented today or tomorrow so I could post more pics. Edited by Braffolk, 15 November 2014 - 08:59 PM. Do you have a graphics card? It could be that your graphics card doesn't support shaders. Ill make it detect if the graphics card supports them and if not then it wont use shaders. Like the cursor idea! Simplicity is always a plus for me with controls. Is there water? Does it flow? Looks awesome man i hope your'e able to fix this one! That usually means you have the wrong directx installed, or your pc doesn't support shaders. Oops thanks Lukan. I'm pretty sure its direct X related. Edited by Bustelo, 18 November 2014 - 03:26 AM. That's probably because your computer doesn't support shaders, Ill look into what I can do. There isn't 'one world' in a save , every world is a level and they can be from 1024x512 (blocks) to 32000x512. Yes, there will be way more dungeons though. I'm not sure what do you mean by "Does it flow", there are many ways I could make it "Flow". And yes, I have a 'water engine'. Edited by Braffolk, 18 November 2014 - 09:36 AM. I also need to know what GPU's do people have who get shader errors. Edited by Braffolk, 28 November 2014 - 06:34 PM. Uh oh, It only supports pixel shader version 2.0 so that is the problem. if performance doesn't change too much then I might create an alternative to support GPUs like that. if you have other hardware as old as that. Edited by Braffolk, 28 November 2014 - 07:04 PM. Started drawing backgrounds and also fixed all animations. I need criticism on my parralax backgrounds. Edit: Update the parralax backgrounds! Edited by Braffolk, 30 November 2014 - 06:34 PM. I notice there is a stray pixel floating over one of the mountains! Also cool water. That is what I meant by flow. It isn't just a stationary box. Is there swimming yet or is that yet to be implemented? Pine trees look really good with that swing-a-ling going on! I fixed that random pixel already Playing around with day & night cycle right now. But damn does it look nice. P.S. : Is it me or does your sun rise and set in the same direction? Edited by Oelip, 01 December 2014 - 02:15 PM. I fixed that yeah, and I have one control object for terrain & all animated things on it so there I have huge control over everything what's going on. I'm not sure what do you mean by sun rising and setting in the same direction. the sun was going anti-clockwise before, I already fixed that. If that's what you mean. Edited by Braffolk, 03 December 2014 - 07:21 AM. This looks AMAZING! deffinitely playing this! I really like the art style, Keep up the awesome work! I wrote a shader based tilemap renderer for 2Volution with a bit of help from Xor. It can easily render a hundred million tiles realtime at solid 1000 fps. This shader requires your computer to have Pixel Shader 3.0 or above otherwise it will not work. Edited by Braffolk, 21 December 2014 - 01:08 PM. I have been rewriting a lot of things and made the game a lot faster. over 10 times less ram. game maker still has tiny problems with it even though in another project it ran at 1500 fps. most of it is fully functional. Major fixes and rewrites are completed now so I can move back to adding proper visual content, most likely the first thing will be the combat engine. Edited by Braffolk, 03 January 2015 - 07:35 AM. Well, it was too low but the thing with 2Volution is that worlds are more sort of levels, you go through one, it generates you another one. as it would slow the game down and only offer bigger worlds which for 2Volution is unnecessary. Edit: when it comes to comparing with terraria then Terraria's "Large" world size is 8400x2400 and small is 4200x1200. Edited by Braffolk, 04 January 2015 - 12:14 PM. What did you use to get your trees to have a swaying animation like that? It's really good and I wanted to know how I could so similar tasks myself. That will give me a value that will smoothly circle around -1 and 1. Nice wall riding. Looks smooth. If you wrote a DLL, does that mean you are going for a windows only platform? Being a windows guy, I honestly don't care, just curious. Also for your dll, is it anything like that ds_bin dll thats been around the forum forever? Is your dll faster than buffers? Being a little pessimistic, I was thinking your dll might be antiqued pretty soon with GMS 2.0 introducing int/bool declarations. I'm assuming an array (or grid if its supported) filled with ints will possibly make your dll obsolete. Looking forward to combat! Glad to see an update. Actually I can compile it to xcode too so it would work on mac. it obsolete as it's pretty easy to rewrite it. 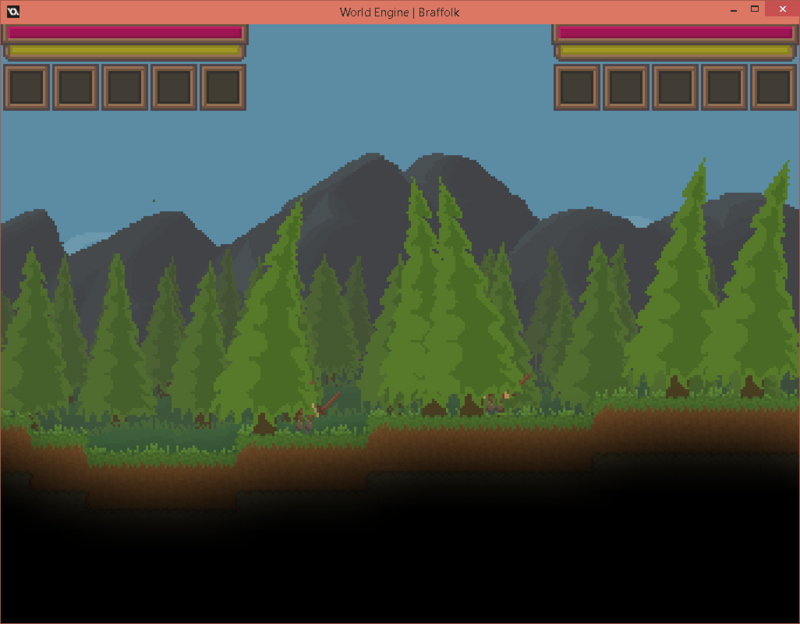 Basic combat is pretty much completed, there are still some minor things to add and a few things to tweak. Edited by Braffolk, 04 February 2015 - 02:38 PM. do you have plans of a PVP mechanic? Bout time you came back with an update! Nice! Dual wielding combat! Any plans for enemy archers or other ways to add combat variety? Is the pathfinding A* or something faster but less robust? That one pink box seems to have trouble with the double jump. Is that intentional? Why is the main character glowing in that one gif? Dungeons look cool too but will be more impressive when it's an actual ingame screenshot. I have already drawn a few archers. And just to clarify, there will be a huge variety of combat styles, weapons and enemies. Player is glowing because there is lighting enabled in that scene, I implemented lighting awhile ago and currently the only light source is the player. The pathfinding is not A*, It's a node based system where the player adds nodes to where they have been to, all of the nodes are in a list so it's easier to handle them and they are way faster to delete, simply by limiting the size of the list. The follower now will try to find the nearest node to the nearest enemy and if they can reach it they will follow it , once they have reached it they will try to find the next node and they will repeat the proccess until they have found the player. It's half intentional that the pink box is having trouble with the walljump. There will be PVP but I don't have any specific plans for it yet. not work on 32 byte computers ? This game looks fantastic and it's coming along at a great pace.... Have you thought about making an IndieDB page and trying to push it around the social media a bit more to get more interest? I think a lot of people would like this, especially given lovely it looks and how nice these demos play. I have thought about creating an IndieDB page and will probably do that in the near future, 2Volution has 6000 followers on GameJolt so I don't think there's a huge need for advertising right now. It works on 32bit computers. Did you get an error? This is probably a dumb question, but isn't gamejolt just for free games? Does that means you have no plans for sales? GameJolt is only for free games right now and that will change in the near future... I do have plans for sales but I will release alpha & beta without any restrictions for anyone to play & test. 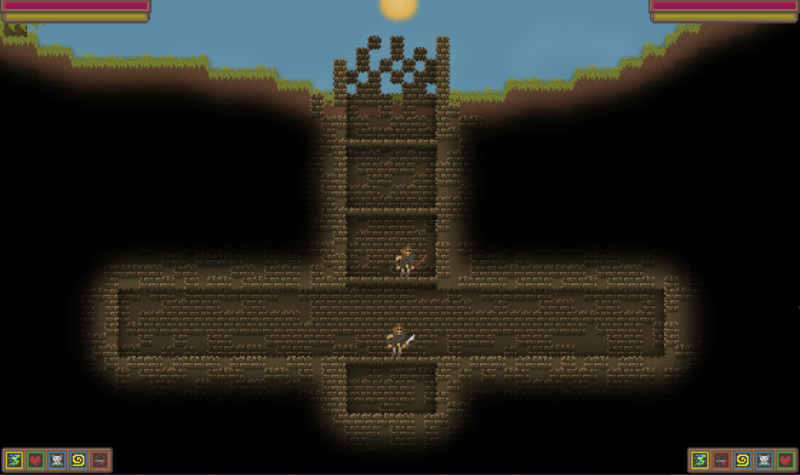 I'll be posting another update in a week or two about random generation for dungeons if I have them implemented. Edited by Braffolk, 05 February 2015 - 04:39 PM. Try redownloading it, broken .exe files cause that error for me usually. Edited by Braffolk, 06 February 2015 - 10:45 AM. I try work your game an other computer but I get same error "is not a valid win 32 application"
Can you correct problem ? because I want play your game. Edited by pencpeci, 06 February 2015 - 05:17 PM. That error is mostly caused by either some files being missing or the executable being corrupt. The current engien demo isn't really a game yet so you wouldn't be losing anything if you can't play the current demo.